Gov. Roy Cooper and legislative leaders agreed Monday to extend a temporary restraining order blocking the merging of the State Elections Board and the State Ethics Commission. The parties were set to appear Wednesday at a hearing for a preliminary injunction, which would halt the merge until the conclusion of the case. 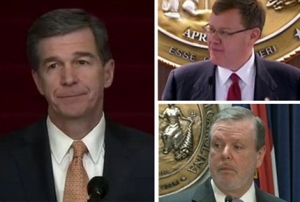 Cooper is suing Senate President Pro Tem Phil Berger and House Speaker Tim Moore over Senate Bill 68, a re-worded measure similar to SB4 which combines the Elections Board and Ethics Commission into one new bipartisan board. SB4 was struck down earlier this year, but legislative leaders say SB68 was written to address concerns from the judiciary. Cooper argues that the new bill still violates the separation of powers clause of the Constitution. You can read more about both sides’ argument here. The parties will appear at a summary judgment hearing in front of the three-judge panel either May 31 or June 1, according to the Trial Court Administrator in Wake County.